How to do more with less. That’s today’s lesson. For the second part of the equation, we turn to the National Association of State Budget Officers, which says that K-12 school spending will be little changed this year. What’s more, any spending increases that are called for are targeted to specific areas, with other programs flat or even cut. At the same time, the educational needs of K-12 students continue to grow. So, it’s not surprising that schools face budget challenges. Part of that has to do with energy costs, with schools spending more on heating, ventilation, air conditioning (HVAC) and lighting than anything other than staff. Now, here comes an answer to this tough problem. One way to squeeze more out of every energy dollar spent is a building management system, or BMS. However, a BMS is typically out of reach for a school. They operate on a strict yearly budget and a BMS is an investment difficult to fit within that spending. Fortunately, there’s another approach: smart energy management with sensors, valves and actuators. They’re the foundation of a building management system. To see what’s possible, consider that K-12 schools spend more than $8 billion (€7 billion) annually on energy, according to the Center for Green Schools. Upping energy efficiency and becoming greener can save more than $12 a square foot or €105 per square meter. That money can be diverted to other parts of the education budget. It’s not just energy efficiency and money savings we’re talking about. 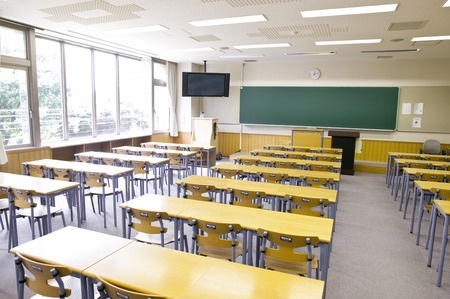 Green schools have reduced absenteeism by 15% and raised student test scores by 5%. Also, energy efficient solutions can include CO2 sensors, part of a system to adjust ventilation as needed. That helps ensure a healthy air flow and environment. OK, I can tell what you’re thinking. You’re working with school buildings that … aren’t the newest. Will this stuff actually work in the real world? You bet. Take a New Jersey school district, located just outside Philadelphia. The buildings were new about the time the Beatles first appeared on American television, which any of today’s K-12 students will tell you is about as long ago as when dinosaurs roamed the Earth. All told there are five buildings, with large, drafty gyms and auditoriums along with small showers, bathrooms and kitchens scattered throughout them. Flowing hot water provides heat and is also used domestically. The school district is upgrading the actuators that manage the water flow in 3-way mixing valves. Those valves and actuators send in just the right amount of cold and hot water. That’s important to safety. A valve can be all the way closed or all the way open, shutting off hot water completely or having it on to the max. If the connection to a controller is lost, a modern actuator can set a valve at a predetermined spot. So, no child need get a scalding during hand washing, even if the controller is out of commission. An actuator is also critical to improving energy efficiency. Say it’s a sunny day and the buildings are warming up. With today’s actuator, the flow of hot water can be stepped down, meaning less is wasted. And if it’s a cold day, more can be sent out, making students and staff more comfortable. Actuators offer further improvements when combined with occupancy and CO2 sensors. Then lights can turn on or off automatically, along with other energy saving adjustments – such as the flow of hot water. There are other potential savings. Up-to-date actuators and other field devices can provide a wealth of information, including in some cases self-diagnostics. Such data could make preventative maintenance possible. That means no more hurried and expensive repairs. So, there you have today’s lesson – how to achieve energy savings, greater comfort, and maybe even lower maintenance costs. It all adds up to more money for educating students – and it’s all begins with setting a firm foundation with the right actuator.